After an absence of 45 years, Gibson Kente’s musical drama How Long? returns to the South African stage in a prestigious new production presented by The Playhouse Company, an agency of the Department of Arts and Culture. The show will run in the Playhouse Opera from May 5 to 27, 2018. “It is fitting, as we salute Africa Month that we honour the memory of Gibson Kente, one of the formative figures of South Africa’s theatre scene,” said Linda Bukhosini, the Company’s Chief Executive and Artistic Director. “We at The Playhouse Company are proud to have assembled some of the best artists in our country. Directed by Duma Ndlovu with choreography Somizi Mhlongo and musical direction by Phelelani Mnomiya, How Long? stars, among others: Thembi Mtshali, Phindile Gwala, Khaya Dladla, Mondli Makhoba and Nqobile Ndlovu. “At the request of Mr Ndlovu, The Playhouse has commissioned the orchestration of Mr Kente’s music which will feature a six-piece band and 13 piece orchestra ensemble, thus ensuring a musical collaboration amongst artists of different races groups. This highlights the importance of making social cohesion and nation building a practical reality, thus encouraging a positive narrative of common artistic experiences among people of different racial groups,” Bukhosini said. A melodramatic musical play with political undertones in Gibson Kente's famous township theatre style, the work is based on the death of Khulu, a helpless grandmother, through brutal police action under apartheid bureaucracy. Kente wrote the play as a response to pressure from Black Consciousness structures that all cultural work needed to reflect the material conditions of Black people in South Africa. Kente rose to the occasion and How Long? exploded on township halls and the black masses responded. The play was later banned and Kente was imprisoned as a direct result. Part of a trilogy of the only political plays by Kente, the work was written and last performed in 1973 before it was banned. “Gibson Kente was a man who generously shared his wisdom and his theatre expertise with younger actors privileged to work under him,” said director Duma Ndlovu. “In this regard, he helped launch the careers of South African icons such as Darlington Michaels, Mbongeni Ngema, Sello Maake KaNcube and Brenda Fassie. Shortly before he died in 2002, Gibson Kente entrusted me with the responsibility of representing his music. To this end, in 2004 I was instrumental in the Gibson Kente Foundation coming into being. “Where his contemporaries such as Athol Fugard, who like him stood against social and political injustice in this country, took their work into the cross-over arena which drew international limelight, Gibson Kente chose rather to withdraw his work and take it to grass-roots audiences in black townships, where the people saw his plays being performed in community halls. This earned him the true epithet of the ‘Father of Black South African Township Theatre’. As the custodian of the Gibson Kente Foundation, it is my honour to keep Bab Kente’s legacy alive, and I am excited to be directing this masterpiece, The Playhouse Company’s new production of How Long,” Ndlovu continued. For many years himself one of the brightest lights on South Africa’s cultural landscape, Duma Ndlovu is internationally renowned as an acclaimed playwright, director and executive producer, working in the fields of film, television and stage and many others. The Executive Director and Founder at Word of Mouth Pictures, Ndlovu has over the years, produced a body of work that reads like a lexicon of creativity in the annals of South African Show business. From creating his early masterpieces such as Bergville Stories, to big stage productions such as The Game - which has been seen twice by Playhouse audiences over the past two decades - his portfolio also includes being the South African casting director for Disney’s mega-hit Lion King companies, and creating hugely successful, long-running TV soap operas such as Muvhango and Uzalo, and most recently, Imbewu The Seed, currently screening on e.tv. Ndlovu is the custodian of the Gibson Kente Foundation. Choreographer Somizi Mhlongo has been in the entertainment business for almost 30 years. His career began when he was 13 years old – he joined the Broadway musical Sarafina! and travelled the world for five years with the production. He later starred in the film adaptation of Sarafina! which also became the first big project he choreographed. As a young star he featured in the movie, Cry, The Beloved Country. Somizi has rooted himself as a vanguard of the South African entertainment industry, becoming the go-to choreographer for high-end stage and television shows and hosting live events and music video productions such as SAFTA and SAMA Awards, working as the lead choreographer for Miss South Africa pageants from 1998-2008 and appearing on his own show on Cliff Central. Heading the cast of How Long? is actress Thembi Mtshali, revered leading lady of the South African stage and screen. A Lifetime Achievement honoree at the 2017 Naledi Awards ceremony in Johannesburg, Mtshali-Jones commands a fan base of thousands through her creations of many memorable persona in the entertainment world over the years. She first became a household name with the popular comedy, Sgudi Snaysi, and most recently appeared in the drama series, Broken Vows on e.tv. While popular TV actor Khaya Dladlas’s widespread celebrity status has earned him off-screen popularity as one of the most popular emcees in the business, Dladla has 20 years experience under his belt, focusing on a musical background, working with Mbongeni Ngema, Edmond Mhlongo, and the late Themi Venturas, appearing in productions such as Oliver The Musical, Jabulani South Africa, and Master Harold and the Boys, to name a few. He is widely known for his TV persona in Uzalo as GC. He was Best Supporting Actor 2015 at the Simon Sabelo TV and Film Awards. 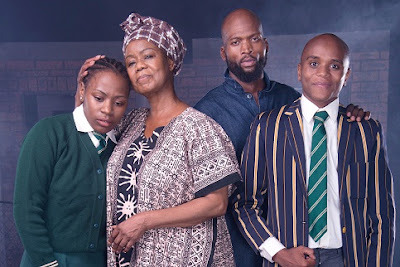 While new-generation TV star, Uzalo’s actor-dancer, Mondli Makhoba, brings his own pulling power to the cast of How Long, He appears as Captain in Generations –The Legacy, and is currently shooting the role of Shukela in Imbewu - The Seed. Other credits include TV appearances have included Ganda in ISithembio on Channel 161, and playing Balla Koro in Roots on the History Chanel; roles in the Australian films, Paper Planes and Casualty; and on stage, the South African stage musical, Amambazo, as well as three Australian productions, Skip Miller’s Hit Songs, Moving to a Shared Beat, and Conflict Under the Australian Flag. Another noted young actress who is set to appear onstage in the Gibson Kente classic is Nqobile Ndlovu, best known for her starring role as Nobuhle Zungu in the SABC1 drama series Ingozi, which was created by Duma Ndlovu. Nqobile was also a member of the choir in Ndlovu's SABC1 soap opera Uzalo; and in his stage production The Game, set in a female prison. She also played the receptionist, Bongi in the Venda soapie, Muvhango.